Today, I was choppin’ broccoli (SNL reference)! I can’t take full credit for this recipe. If you search the web, you’ll find several versions of it out there. I’ve seen it in the deli at the grocery store too. Usually J makes this recipe at least once a year during the summer. It’s one of his favs. He usually adds tomatoes to his which as you know, I don’t like. But I was craving the salad and was having company today so I decided it would be a nice cold lunch for a hot day here in St. Louis at the end of summer so I made my own. The base of the recipe is usually always the same. 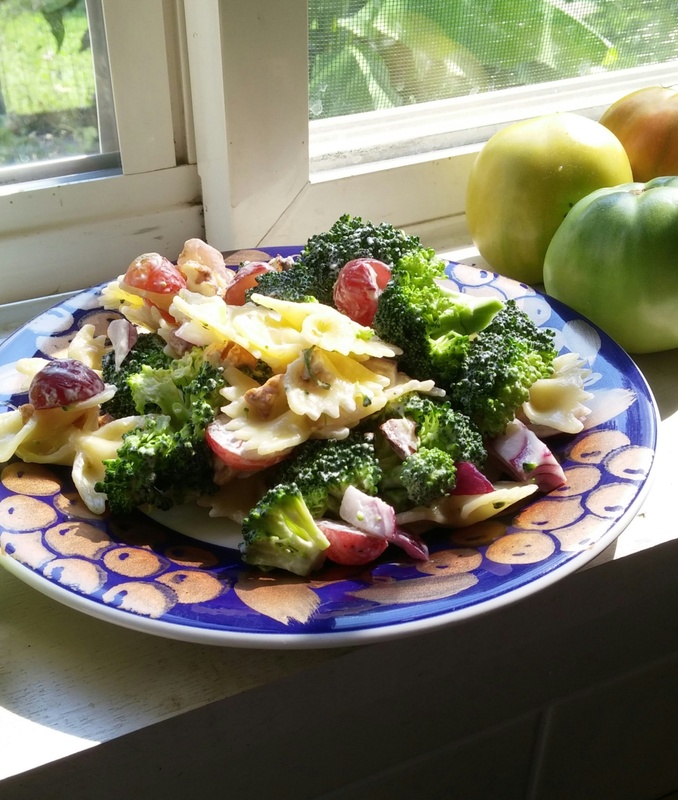 You start with about 4 cups of fresh broccoli, a cup of chopped grapes, and 1/2 cup of chopped purple onion. Some people add pasta and some don’t. I chose to try it with 2 cups of bow tie pasta. Some people add nuts or Bacos. I added about 1/2 cup of chopped pecans. Some add carrots too, but I left those out. That’s it for the salad itself! It serves about six. The dressing is just 1 cup of mayo mixed with a few tablespoons of apple cider vinegar and about 2 tablespoons of white sugar. Mix that well and pour it over the salad and toss. The dressing should be sweet with a bit of tang. I’m not a huge fan of mayo so I stick to one cup for my dressing, even though this size of salad could probably use double the dressing if you want it to be a bit more creamy. Remember the grapes give the salad a sweet taste too so don’t go overboard with the sugar in the dressing. Once I’ve added the dressing I put the salad in the fridge and let it chill for a while before serving. Chop the broccoli if needed. Mix the pasta, broccoli, grapes, pecans, and onion in a bowl. Mix the vinegar, mayo, and sugar in a container and pour over the salad and toss well. Add salt and pepper to taste. Store salad in the fridge for about 15 to 30 minutes before serving. If you serve six, each serving is about 386 calories (most of this is from the mayo so tread lightly). There’s about 6 grams of protein and 6 grams of fiber per serving as well. This is a great summer salad for parties or brunches. You’ll be surprised how well the grapes, onion, and broccoli go together! Thanks. I should really use the solid festiveware for my dishes that I blog about, but I have two sets of “grape” dishes that I absolutely love. Yeah, they look Italian but I don’t care.